Kerith Brook has now closed. Tucked away at the quiet end of Boundary Street, West End's Kerith Brook Cafe takes its unusual name from a biblical stream where weary travellers could rest and be fed. Likewise, the cafe itself is an inviting haven for diners and drop-inners seeking a quiet break. 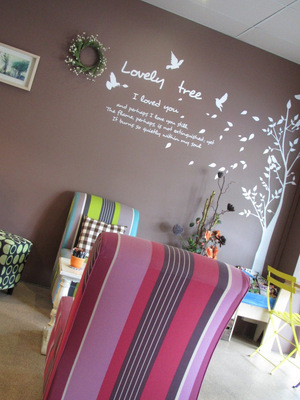 With its calming colours, comfy armchairs and serene atmosphere, the cafe seems far removed from the bustle of West End's main shopping strip, even though it's just five minutes walk away. Kerith Brook's relatively small menu offers coffee, tea and other beverages ($2.50-$5.00), cakes ($4.50-$5.00), breakfasts ($3.50-$11.00), and light meals and salads ($12.00-$13.00). 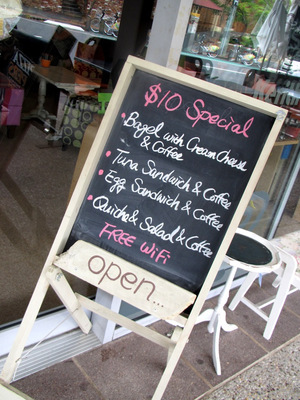 It pitches itself a little above your average cafe, both in menu and in prices. For my lunch, I had a King's Burger -- a lean beef patty with fresh greens, avocado and house-made relish on thick wholemeal bread ($14). It wasn't really a burger (sitting on, rather than in, the bread, and requiring a knife and fork to eat), but it was still good -- tasty, well-cooked, fresh, and low-fat -- a rarity among burgers in Brisbane, even in better establishments. 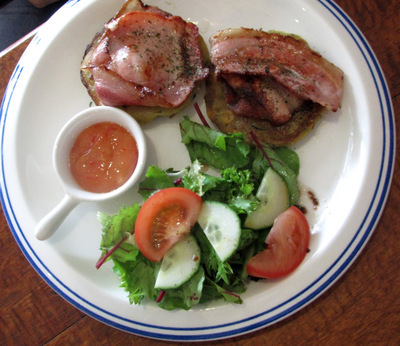 My friend tried the zucchini, potato and corn fritters with bacon and salad ($13). While not a low-fat choice like the burger, the fritters were also tasty, and made a satisfying lunch. On a return visit, I tried a chicken and avocado toasty ($8.50). It was crispy and flavoursome, definitely a cut above your average cafe toasted sandwich. I finished with a Turkish apple tea, which was fragrant and delicately flavoured ($4). On both of my visits, the cafe was doing a steady trade, with a wide variety of customers trickling in and out. They ranged from tradies to well-groomed local ladies, and included young groovers carting their laptops to take advantage of the cafe's free wi-fi. There were no loud conversations, no raucous music; everybody seemed content to enjoy the cafe's gentle vibe, whether inside at a low table or bench, or outside enjoying the sun. I got the sense that many of those visiting were loyal customers, who've made Kerith Brook part of their regular routine. Service was friendly and unobtrusive, though a little too laid-back for me on occasion. When two items that we chose from the menu were not available, we received no apology -- just a 'That's run out for today'. We also weren't told that it was counter service, and didn't spot the note on the menu, so sat waiting for quite a while before it dawned on us that we needed to go to the counter (six feet away) to order. These minor quibbles aside, I liked the Kerith Brook experience. It doesn't offer the world's biggest menu, and it is more expensive than many other places you can dine in West End. 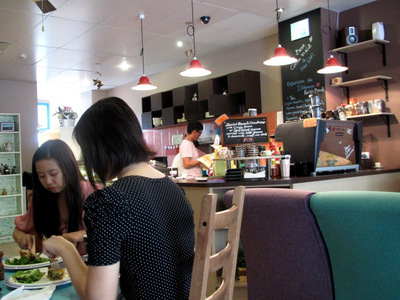 But this little cafe offers tasty food and a genuinely different ambience from most of the nearby eateries. I found its decor soothing and pretty, and its quiet tables the perfect place to have a conversation with a friend. I'd recommend it if you're looking for a peaceful place to grab a bite or a cup of coffee. PS After you've eaten, you might like to stroll a minute up Boundary Street to Mona Lisa fashion and homewares, one of West End's hidden gems, which I've reviewed in a previous article. Oh, and if you're looking for a mellow coffee-shop in the city, I suggest that you try Java Coast Cafe, one of my favourite hangouts in the CBD.